How has Lithuania dealt with its role in the Holocaust? In a thoughtful manner, Rabbi Yisrael Rosenson, an expert on the country, tells INN.. This past week, the Prime Minister of Lithuania, Andrius Kubilius, was a guest of the Israeli government, on a state visit to Israel. For many Jews, just the mention of the name “Lithuania” is painful; after all, the Lithuanians were among the most enthusiastic supporters of Nazis outside Germany, with Lithuanians from various backgrounds volunteering to help round up and kill Jews eve before the Nazis arrived in the country in 1941. Jews were rounded up by the thousands, brought to the forests surrounding the towns where they were massacred, falling into the huge pits they had been forced to dig. Lithuanian forests, beautiful and green, abound in these large, now- covered mounds. The assistance rendered by the Lithuanians, historians say, was one of the reasons the German killing machine that operated in the country between 1941 and 1945 was the among the most efficient in the entire Nazi empire – with 95% of Lithuanian Jews murdered by the time it was all over. For years, Lithuania failed to own up to its responsibilities and its past, and it was only in 1995, five years after the fall of communism, that Lithuanian leaders apologized for their countrymen's role in murdering Jews. According to some Israelis and Jewish leaders, however, the Lithuanians' efforts to build bridges with Israel and the Jewish people today are, if not a sham, then a convenient way to build up its relations with Europe, which requires Vilnius to put on a mask of “introspection,” at least where the Holocaust is concerned. Rabbi Rosenson, director of Michlelet Efrata, is the author of the Hebrew work “Jersusalem is No Longer in Lithuania,” an account of the history of the Jewish community before and during the war. The book's title alludes to the flourishing Jewish community in Vilna, once called "Jerusalem of Lithuania". After the war, Lithuania fell into the hands of the Communists, being absorbed directly into the Soviet Union – further cause for anti-Semitism, as many Lithuanians identified Communism as a “Jewish plot.” During those years – under Soviet influence – the destruction of the Jews was ignored, and the only thing generations of Lithuanians learned about the war years was the Nazi hatred of Russians and Germany's war against Russia. As the Lithuanians felt persecuted by the Soviets, says Rabbi Rosenson, some even saw the Nazis as allies against Communism. As soon as Communism in Lithuania fell in 1990, though many of those attitudes changed, Rabbi Rosenson says, and today, the Holocaust – and the persecution of the Jews during the war period – is taken very seriously. “Lithuania has its own Holocaust Memorial Day – September 23rd, the day the Vilna Ghetto fell, and this day is taken very seriously by everyone, to the highest levels of leadership and society. The country also has many citizens who themselves, or whose parents, helped hide Jews – what we call “the righteous of the nations” - and these people are highly honored in Lithuania. Lithuania's relationship with the state of Israel reflects this change, Rabbi Rosenson says. “Lithuania is striving to be a European country, so it has adopted European attitudes, which are sometimes critical of Israel. But in 1995, the Lithuanian Prime Minister came to the Knesset and apologized for what his people did – long before former leaders of other former Communist countries, like Ukraine, did. 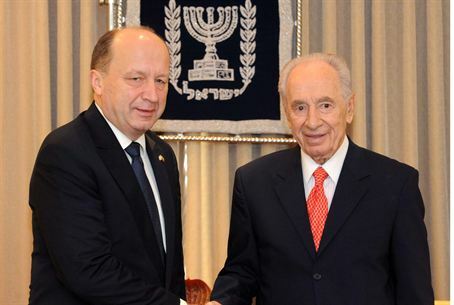 And the fact that Lithuania has an embassy in Israel is significant as well,” he says. “Lithuania is a small country with a limited budget for foreign representation, and it does not have embassies in Jordan and Egypt.